If you’ve ever been a proud owner of an Apple Watch, you’d know how frustrating it is to see your three activity rings only halfway closed as you’re about to head to sleep. Sure, the Apple Watch might just be another watch in the grand scheme of things, but it is undeniable that it has changed the way we approach our health and fitness every day. And that is a fact that Allan Wu, Bobby Tonelli, Edward Russell, and Joakim Gomez can attest to. We recently had the chance to speak with the personalities and pick their brains on how the smartwatch has enhanced their everyday lives. The interviews have been edited for clarity. Yes, you can take your Apple Watch for a swim. Allan Wu is a familiar face to anyone who has tuned in to The Amazing Race Asia. The Californian-born, Singapore-based actor and host has no qualms about showing off the results from his fitness routines on his Instagram feed, and that’s something we’re all grateful for (gratuitous eye candy or that extra motivational push, that’s your prerogative). Whether he’s at the gym having a good pump or supporting his children at their sports tournaments, you’ll see Wu sporting his Apple Watch and one of the many varieties of bands in his collection. Are you more conscious of your fitness and health since you began using the Apple Watch? I have always been very conscious of my fitness and health since I was a teenager. However, the Apple Watch definitely helps to track my activity and fitness levels much more accurately, making me even more accountable to my overall health. How does Apple Watch help you in your day to day life? Not only has it enabled me to track my daily activity much more accurately, but it’s allowed me to not be dependent on my iPhone for making calls, sending and receiving text messages, and even listen to music on its own. What Apple Watch feature can you not live without? I really like how Apple Watch allows me to listen to my music on a run without the need to lug my iPhone (or anything else) along. What is a personal project you are looking forward to the most in 2019? I started getting into training and participating in the Spartan obstacle races. I’ve done a few and really enjoyed them, and now I hope to complete the longest and most challenging one called the “Beast.” That one will definitely put me and my Apple Watch to the test, and I can’t wait! Follow Allan on Instagram at @wulander. Not just a smart watch, a stylish one too. 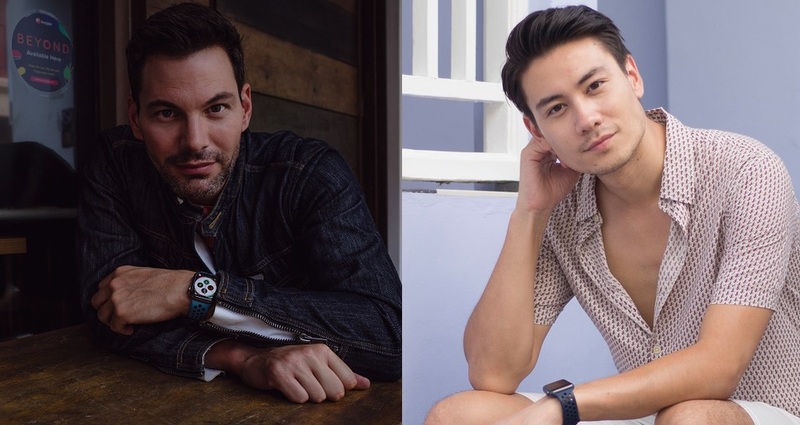 Bobby Tonelli and his brooding smoulder, name us a better duo. The 43-year-old actor/host has made an indelible mark in the Singapore entertainment industry, having had roles in iconic serials of the past The Little Nonya and Fighting Spiders. Since then, Tonelli has branched out into the technology realm as well with his YouTube channel, Tech360.TV. There, he reviews some of the newest gadgets like your flagship smartphones and hella-expensive cameras (Leica and Hasselblads, anyone?). What are your fitness tips for those about to embark on their fitness journey? Give yourself a goal and remind yourself of that goal every day. Don’t try to complete it so fast you burn yourself out and revert back to your old ways. Yes, the activity rings are a visual cue that helps me keep track of my daily progress. I use the “Competition” feature as well to compete with people on a variety of workouts, and that helps push me to get out there and workout. As I ride a motorcycle and road cycle, I really appreciate the “Fall Detection” feature. The ability that the watch can alert emergency services and your contacts if something wrong happens is an invaluable, life-saving tool. Many. Besides work and family, I want to get certified in scuba diving, more adventure motorcycling, high-performance driving, cycling in a variety of locations and building on my photography. 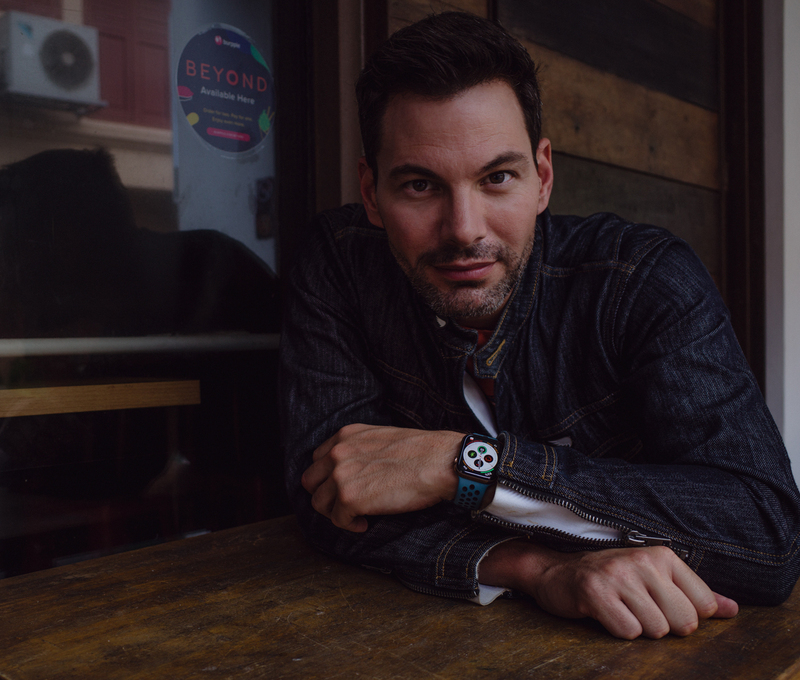 Follow Bobby Tonelli on Instagram at @btonelli. Arm candy to complement your OOTDs. Hosting, acting, writing, modelling: What can’t Edward Russell do? You’ve probably seen the multi-hyphenate presenter anchoring Fox Sports Network flagship programmes like the MotoGP World Championship and Fox Sports Central. Oh, and have we mentioned how debonair this man is? Russell manages to find his own style without looking like an arrogant peacock. His Apple Watch is just the cherry on top to complement any outfit. The key to reaching your fitness goals is patience. It’s all too easy to become disappointed or disillusioned when you don’t see immediate results and then give up. Instead, know that even if you don’t see improvements from the outset, the work you’re doing is still having a positive effect on your body, and ultimately it will show its gratitude. Absolutely! It’s crazy how much motivation can come from wanting to close three virtual rings. Not only does it encourage me to walk that little bit further or work out that little bit longer in order to close the rings (and collect those awards), it also provides the satisfaction of knowing that the amount of effort put into a workout has paid off in terms of calories burnt. Aside from all the health and fitness apps, one of the most invaluable features is one of the most basic – seeing the time in different countries. Because of my job, I’m either overseas reporting live from sporting events or in the studio presenting races and matches that are happening on the opposite side of the world. With the infograph watch face I can immediately see what time it is wherever the relevant sports might be taking place. I know it’s a bit of a cliche, but I really love what I do and so honestly I just look forward to going into the studio every day! No two days are ever the same, and whether I’m presenting football, tennis, or motorsports, the storylines are always changing and evolving. The hours in the studio or on-site might be long, but talking sport for hours on my end is not only my job but my passion and so I wouldn’t have it any other way! Follow Edward Russell on Instagram at @edrussell. No doubt you would have heard his voice on the drive back home from work. 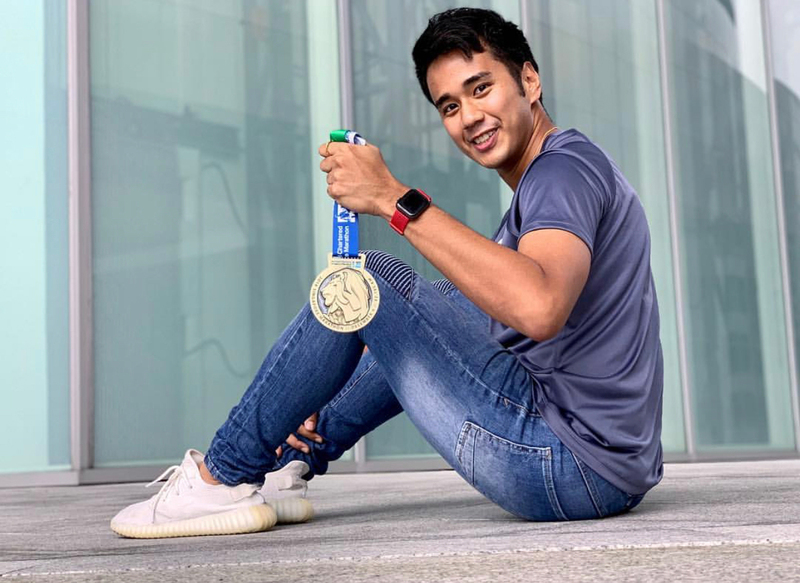 But did you know that besides being one half of 987FM ‘s “The Shock Circuit,” Joakim Gomez is also an avid runner? Yeah, he’s one of the fabled men who are fit enough to run 10Ks for fun and finish the Standard Chartered Marathon in the time it takes for us to get out of bed on the weekends (4h 12mins, FYI). When it comes to runs, always start slow and with short distances. Perhaps a good 15-20 minutes first. Do that religiously for 2 weeks, then slowly ramp up the timing. Running a fast 10KM does not happen overnight. Slow and steady is the way. I feel that it amplifies what I believe in and my lifestyle. It helps to monitor the important bits like the calories I’m burning and the amount of time I spend standing up. It’s always nice for the watch to remind me to stand or move a bit especially if I have been on my bum for too long. I run regularly so being able to monitor the distance I cover is a plus. The bonus is the “wear and go” aspect on the watch. I can immediately start running without spending 10-20 minutes waiting for my watch to sync with the GPS. Is there a feature on Apple Watch that you can’t live without? I’d say the workout app and Apple Pay. I can use it with my Mastercard on public transport and it has made life so much easier. I don’t even need to bring a wallet out anymore. It has been especially handy for me after my runs. I just go to the nearest petrol kiosk and with the flick of my wrist, I’m out with an isotonic drink. That’s better than handing the cashier a $2 note drenched in sweat. I’m trying to do a full marathon in under 4 hours. I’ve tried this last year but didn’t succeed so I’ll be doing it again this year. For my first ever marathon in 2017, I finished it in 4:27. Thinking I was able to go under 4 hours for 2018, I trained hard but only got a 4:12 finishing time. Even though it wasn’t my target, it was still a 15-minute improvement. Hopefully, 2019 will be the year I do it! Follow Joakim Gomez on Instagram at @joakimgomez.